There is much that needs to be said on the theological side about guns, and I (Thomas) am working on that. But this article by Mauck and Baker, a legal firm in Chicago begins dealing with the legal side of a pistol packing pastor. Check out Should Your Pastor Pack Heat? by Mauck & Baker, LLC. To close out the week, I wanted to share some basic policies and procedures to give you an idea of how simple this can be. You can modify these examples to fit your needs, or your can create your own. The policies and procedures that I am sharing with you are from a church that I have worked with, so these are actually policies and protocols that are in place. This first one deals with ushers as a part of the security team. These protocols are not intended to be all inclusive, but rather to provide guidance in the event that an active shooter situation occurs at (Insert name) Church. An active shooter is an armed person(s) whose actions are immediately causing death or great bodily injury. In order to reduce death and injury, there are actions that can be taken to reduce the death and/or injury. Be mindful that certain members in the congregation have a CCW permit, and may take it upon themselves to take action. Make sure you are not in the line of fire of a potential concealed weapon carrier if they decide to become involved. (Insert name) Church does not advocate carrying a firearm, but recognizes an individuals’ Constitutional right to do so. For that reason, the church does not forbid the carrying of firearms on church premises. As you can see, it is pretty simple and pretty straightforward. The absolute worst thing to do when writing these policies and procedures is to make them complicated or confusing. This could render the individuals tasked with doing these job somewhat ineffective because they will have too much to remember. Below is another example of policies and procedures, but this one is for mitigation measures undertaken by the audio technician (in that same church). The audio technician in the church that uses this protocol has the responsibility of watching the motion detectors, security cameras, and the electromagnetic door locks. Audio technicians are the first line of defense against active shooters that may want to cause death and destruction at (Insert name) Church. This guidance is provided to assist audio technicians in making decisions that may affect the life and safety of the congregation for active shooters or any other risk that may present itself while congregants are present in the building. -Prior to service (or other event) check with ushers to make sure all but front doors are locked. -If there is no doubt that this is an active shooter, alert everyone by yelling “Gun”-three times. -Upon announcement of a potential (but not positive) threat, the ushers will investigate to determine if it is an actual threat. You may be required to temporarily unlock the doors to allow two of the ushers to walk outside and investigate. Under no circumstances should you to allow entry of the suspicious individual(s) until they have been cleared by the ushers. -Upon a real threat being identified, ushers and the safety and security team will evacuate or secure all members of the congregation in a safe area. If some ushers are outside, they may engage the shooter; do not open the door if they have engaged them, except to let other ushers out to assist. -You will be responsible for viewing the video cameras and identifying the location of the threat to the best of your ability.­-Some individuals with CCW’s may engage the shooter. If they do engage the shooter, do as instructed in regards to door locks and identifying the location of the shooter. Yesterday, I discussed how to choose which mitigation measures are best for your specific circumstances. Today, we will discuss implementing those measures. Too often, the committee gets to the point of choosing mitigation measures, and they think that they have completed their tasks. This couldn’t be further from the truth. Once the measures are in place, some type of policy or procedures should be written. Without some form of written guidance, everyone will do their job they way they think it should be done (rather than way the committee thinks it should be done). As an example, after the church has installed electromagnetic locks and security cameras, if the person managing those items does not have direction of what they should do, they may quickly lock a gunman out, but fail to alert everyone that there was a threat at the door. Similarly, if a policy is not in place, some security members may lock all doors but the main entrance, while another individuals does not lock any of the doors, and yet another locks all doors, including the front door. There is also the possibility that one door greeter may use behavioral profiling (to look for threats), while the next greeter may want to check everyone for guns (through a pat-down) and to check everyone’s purses and backpacks. When writing policy, it does not need to be complicated, however it needs to be in place before the mitigation measure is fully implemented. An important part of writing policy and protocols is to be cautious when writing policy, to make sure that the policy does not violate any insurance provisions, thereby voiding their insurance policy. This would not be in the best interest of the church, or those that attend it. Some may ask what would violate an insurance policy. 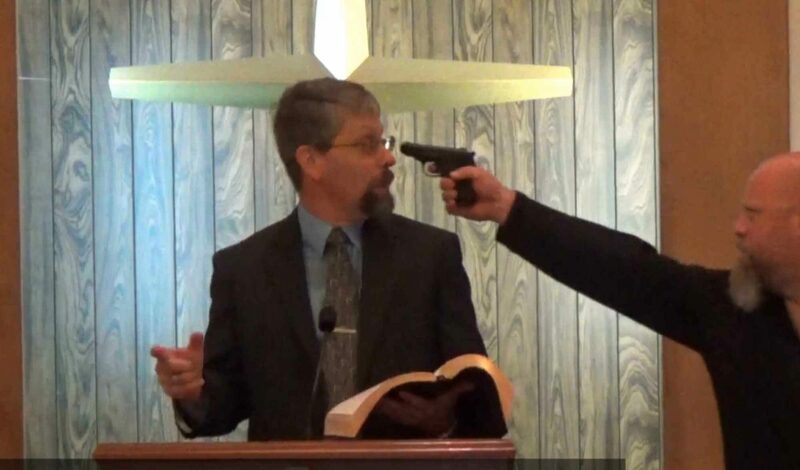 One example that may violate your church’s insurance policy is an armed security team, or perhaps a group of organized concealed carry holders. Before putting a policy or procedure in writing, the committee should probably check with their insurance company to better understand what is and is not allowed. In some instances insurance companies may deny an organized concealed carry group, while in other instances the insurance company may want them trained to their specifications. As you can see from this statement in their policy, the church did not officially form a team, but they covered the issue. They also covered themselves legally. By inserting this statement, they put the responsibility on the person carrying a concealed weapon. When writing policy and procedures, it is important to realize that it does not need to be complicated, but, it needs to spell out what should be done and who should do it. It is preferable to address every job that requires human intervention. There should be a job specific policy for each different group or area of responsibility. In other words, there should be a policy and protocols for the greeters, the security team, the person monitoring the security camera’s, and any other job that may be required to mitigate risks. These policies should be put in a binder , then everyone who commits to keeping the church safe and secure knows what their role is. Each person that is tasked with doing a job that mitigates risk should also be given a copy of the policy and procedures that directly affect the job they will be doing. Many times committees will go overboard when creating policy and protocols. An acronym to remember is KISS. In the fire service we were taught this regularly. For those that don’t know the meaning of this acronym, it is “Keep It Simple Stupid”. Keeping it simple allows everyone to easily understand their role.